Probate is often one of the most dreaded parts of estate administration, and for good reason. No one wants to go to court and litigate their loved one’s assets and dues just a few weeks after their death. Not only is it complex and stressful, but it is also often painful for family members who are still struggling with very raw emotions. The estate planning team from Chesapeake Wills and Trusts can help guide you through the Maryland probate process. We can make navigating this complex process much easier, reducing your stress and letting you focus on healing from your loss. Based on your specific situation, we may also be able to help you put an estate planning strategy in place that lets your loved ones avoid the hassle and expense of the probate process after your death. Call us today at 410-590-1900 to learn more. Even with the first option, the family will eventually have to deal with the probate process when the remaining loved one dies. This means the only true way to avoid litigating your estate is to create a trust with the help of an estate planning attorney. Depending on your circumstances, it might take months or even a year or more for an estate to go through Maryland probate. During this time, the assets held in the estate are unavailable. This can be an issue if your heirs need access to your accounts to pay bills or make ends meet. There are costs associated with going through the probate process. The costs of probate depend on the value of the estate. Going through the probate process means less of your hard-earned life savings will go to your loved ones. Most people like to keep their money matters private and do not want everyone else to know how much money they have in the bank or the size of their debts. During the probate process, your Personal Representative must file a list of your assets and debts with the Register of Wills in the county where your estate is to be administered. Once filed, the list of assets and debts is a public record which means that anyone could search for your records and uncover information about your debts and assets, and who inherited your life savings. This not only makes your personal information public knowledge, but it also could put your heirs at risk if a scammer or thief learns their identity. Any financial power of attorney you signed during your life will expire upon your death. Because the power of attorney is no longer after you pass away there will be a delay in the ability for your family to regain access to your assets until your estate is opened during the probate process. There could be a significant delay between the time of your death and the time the Personal Representative of your estate is appointed. In addition, the probate process could tie up the assets in your estate until such time that all of your creditors have the opportunity to make a claim against your estate. We can help you put a proper estate plan in place that will not only protect your assets but prevent your family from having to deal with court litigation and the probate process after your death. We can explain how this type of plan works in language you can understand, guiding you through each decision and leaving you feeling confident about your family’s financial future. With a trust in place, you can ensure your heirs have access to your assets almost instantly after your death. They can continue to pay bills and have access to the funds they need without waiting months while your heirs wait on the court to permit asset distribution. A trust also gives you peace of mind knowing your information remains private and no one will have access to information about your family members’ inheritance. Because we created the trust according to your wishes before your death, you can also dictate who receives your assets and even how your heirs spend them if necessary. 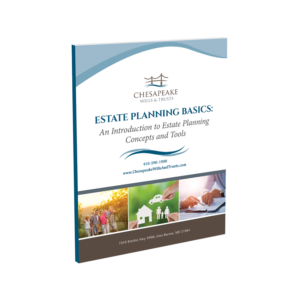 At Chesapeake Wills and Trusts, our team can help you understand how trusts and other estate planning tools can help you make things easier on your family after you pass away. We understand no two families are the same, so we will get to know your unique needs before developing a strategy that will work best to achieve your goals and give you the peace of mind you crave. Call our office today at 410-590-1900 to learn more about our probate services, to sign up for one of our workshops, or to make an appointment with a member of our estate planning team.